This diagram depicts a typical use case of a GPR system. There are broad applications to the GPR technology which include surveying air, water, ice and vacuum. Low dielectric (~1), high velocity material i.e. EM waves travel almost at the speed of light. In air the emission pattern of GPR antennas is broader than in the ground. It is recommended to place the GPR as close to the ground as possible to direct emission energy further into a material. Some applications of GPR include emission exclusively in air. Higher dielectric (>1), lower velocity materials than air. In ideal conditions when the surveyed material is homogenous, an operator of a GPR can expect precise calculations of achieved depths. Transmission into a lower-velocity material (such as from the air into the ground) causes the beam to get narrower. It is recommended to be aware of the composition and electrical properties of the surveyed material to be able to read radargrams accurately. Humidity in a material is a major cause for signal attenuation. The image produced by the signal from the receiver antenna is called a radargram. It is the reflection of the emitted EM beam by the transmission antenna of the GPR colour coded by a carefully selected set of palettes. Palette design is important as it can highlight even the slightest changes in data. The travel time of a beam of EM waves from the GPR into a material. More specifically, it is the Rx module's preset time frame within which it listens for reflections of the EM beam sent by the Tx Module. Time windows play a crucial role in determining the depth of a detected object. It is usually marked on a radargram's Y-axis. The larger the difference between an object and its surrounding material in terms of electrical properties (dielectric constant), the stronger the signal will appear on a radargram (more contrast). Sometimes a single object may produce several reflections one on top of the other caused by cavities within it - for example a pipe. A high precision tool for imaging subsurface and - as is more and more often the case - above surface structures and events. 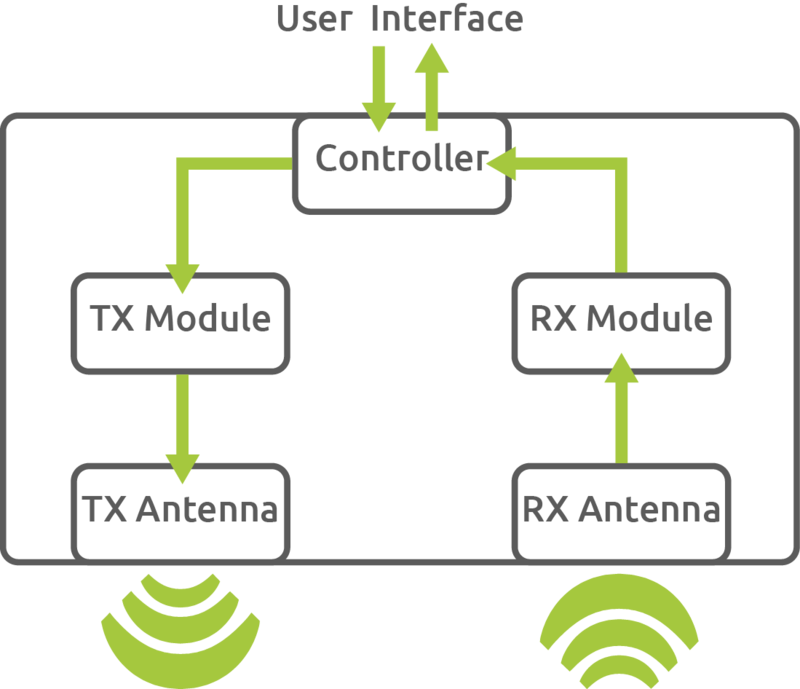 There are different types of GPRs - characterized by their antenna designs, transmission patterns and hardware architectures. Low power consumption, very high dynamic range and producing results directly during a survey are core advantages of this technology. The signal emission pattern of a GPR greatly depends on its antenna design and the transmission medium. Dipole antennas for example are sensitive to all their surroundings including what is above them. Shielded antennas, on the other hand, emit a more focused beam and are not sensitive to objects and events above and next to them. Due to the emission pattern of a GPR, oftentimes an object is detected slightly before it is directly beneath the receiver antenna. Being on the side, travel times of the EM beam to and from the object are bigger hence the start of the hyperbola at the lower values of the Y-Axis of a radargram. As the object is approached, travel times diminish and result in the peak of the hyperbola. This means the object is right under the GPR. Materials with smaller dielectric constants produce broader hyperbolas and vice versa. Hz, Hertz Measurement unit for frequency. It is defined as one cycle per second. Radio Wave Electromagnetic wave with frequency ranging from 30Hz to 300GHz. For GPR the frequency bandwidth is from 10MHz up to 3GHz. Transmitter ->Transmission antenna -> Receiver Antenna -> Receiver data processor. Frequency Bandwidth The spectrum of the radar’s transmitted radio waves’ frequencies. Central Frequency Trasmitted waves by a radar at peak power (usually the center of the frequency spectrum). UWB / Ultra Wide-Band A radar that transmits over a frequency bandwidth of over 500MHz. Oerad GPRs are all UWB pulsed radars. GPR & Time-domain Radar State-of-the-art radar technology with a very high dynamic range and a very low power consupmtion. Surveying / Sounding The act of using GPR technology for object detection/determination. Radargram An image produced by a radar. SEG-Y General purpose file format and a standard for recording geophysical data from 1973. Time Window Operational window of the receiver antenna. This characterizes the theoretical maximum achieved penetration depth of a GPR. Erad Oerad's open radar format for collecting GPR data optimized for small data storage. Dielectric Constant A measure of a material's ability to store electrical energy in an electric field. This has a direct impact on theoretical maximum penetration depth. The larger the dielectric of a material the more charge it can store thus impeding EM waves travelling through from penetrating quickly at depth. The opposite also applies - smaller dielectrics -> less impedance -> bigger wave propagation velocities in the material. Consult our cheat sheet for most common values. Attenuation Reduction in GPR signal amplitude caused by energy dissipation in a material. In practical terms this can be a sign of humidity in a material. Dynamic Range The ratio between the maximum amplitude signal recordable by GPR and its noise floor. GPR Trace A single sequence of sample points collected by the receiver that indicate time variation of the amplitude of the recorded signal (in a given time window). Resolution Smallest detectable difference/object in a surveyed material/soil/wall. Gain Signal amplification by means of hardware or software algorithms. Background removal Adaptive cancellation of the effects of a surveyed material. It takes into account the last few traces received by a GPR module. The fewer traces taken into account, the stronger the filter. DC Drift Low-frequency noise causing the signal to drift from the centre line. Pulse Energy packet emitted from the transmitter antenna. Its properties are length, power and rise time - the measurement of how fast a pulse achieves peak power.